Join the discussion on our forums! Come discuss Auctionmaster Beardo over in our dedicated Auctionmaster Beardo discussion topic. Rotating soon. Feels good man. Good in any deck that relies on Hero power :) Warlock is not that one because they draw health for cards. Hence why you never disenchant. From obscure and incredibly lame to a crucial combo piece in the DK Paladin gameplan! Play him as a 3/4 body Vs most decks. Keep him as a combo piece Vs late game control decks. 2+3+X+2. You can play any 3 or less mana spell to surprise with a double horseman if you manage to keep two on the board. You already play equality and hydrologists, so you wouldn't ruin your deck that much by adding this 3 mana 3/4. Unless your worried about the 3mana slot being too full. Isn't this super good in new exodia paladin deck? This sees play now with the exodia paladin archetype. Encountered this today. 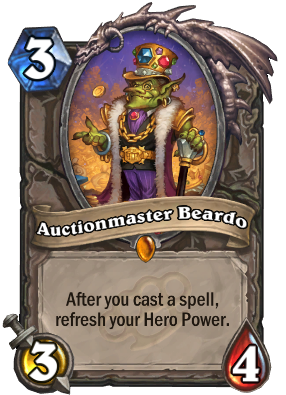 Yeah Beardo might become Meta-defining or at least Very Good with all these incredibly powerful new DK hero powers. Will be warrior quest MVP. Poisoned Blade + Deadly Poison could potentially have some decent synergy with this, but seems terribly difficult to make viable. Somebody give it a whack, I am dust-poor.